Aoife Holden wins the 60x30 singles. 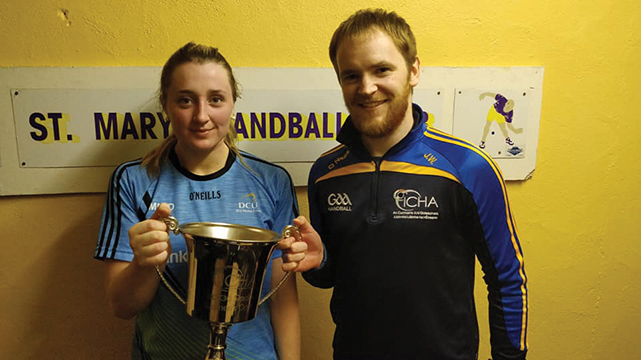 Aoife Holden won the singles crown at the Irish Collegiate Handball Association’s 60×30 handball inter-varsity in Wexford. Holden defeated her DCU teammate and doubles champion Fiona Tully to claim the victory. “I didn’t expect to win it,” admitted Holden. “They had a seeded system and I was number one. Fiona Tully was number two and Sinéad Meagher was three, but there’s nothing between any of us,” she said. Holden admitted that such was the competitive nature of the Collegiate handball scene that a “toss of a coin” on the day usually determined success or failure. “I played Fiona in the final and it was such a tight game,” said Holden. “I’ve played her all up along like juvenile and even intermediate two years ago, so you never know who’s going to win on the day so thankfully I just got over the line,” she said. The World Handball Championship was held in Minnesota over the Summer with Holden being one of the DCU contingent represented. “A lot of us from Ireland actually went out, so it was nice to have a lot of familiar faces around,” said Holden. “Me and my doubles partner Emma Donlan were runners up in the U19 doubles. It was a good experience to play somewhere new and to play new people,” she said. Holden and her doubles partner challenged themselves at home by partaking in the senior 60×30 competition finishing second to Cork in the final. “It’s a bigger step up, a harder grade, so it was great to get games and get experience. We were happy enough with that,” said Holden. The driving factor behind Holden’s success and passion for the game started in her own Kilkenny club of Kilfane. Her father and grandfather were “really big into handball” and they passed on their love of the game to Holden. “When I was six or seven my dad used to bring me and my brother up to the handball alley and I kind of got playing from then,” said Holden. Regarding DCU Holden is optimistic for the future of DCU handball. “It is a big club. I’d know a lot of the guys from outside DCU from playing,” said Holden. “We’re represented very well in the girls and the boys over the weekend in both courts. It’s a good club and definitely growing,” she said. All roads now lead to Galway in a week for Holden for the 40×20 double. Holden is now prepping for the tighter court as the 40×20 collegiate season kicks off just after Christmas.